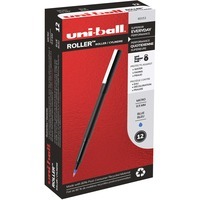 Uni Ball Classic Rollerball Pens SAN60153 $11.01 Rollerball pen offers premium liquid ink and a black barrel with a strong metal clip. Uni Super Ink is specially formulated to become trapped in paper, helping prevent criminal check washing and other document alteration. Quick drying ink prevents smudging. Archival quality, acid free ink is perfect for documenting and record keeping. Ink color is indicated by tip and dot on cap. Use clip to attach rollerball pen to pockets, notebooks and more.